At one point I had had three people ask me about whether I’d read J. D. Vance’s Hillbilly Elegy. One thought it was great, one thought it awful, and the other was noncommittal. They’re all right. Published in 2016, Hillbilly Elegy shot to the top of many bestseller lists propelled by the thought during the last election cycle that reading it could help the mystified understand the American subculture that was Donald Trump’s base. Director Ron Howard thinks so highly of it that he plans to make a movie of it and it is among the top five books (three of which, intriguingly, are memoir) that Bill Gates recommends in his Time Magazine interview we referenced earlier. Vance tells the story of his life growing up in Middletown in southwestern Ohio, in a transplanted rural Appalachian (read: eastern Kentucky) culture. I myself grew up in southwestern Ohio well aware and somewhat disdainful of the Kentucky migrants of whom Vance writes. Many grow up in broken homes and many struggle to prosper against adversity, and so many stories like this can be told. 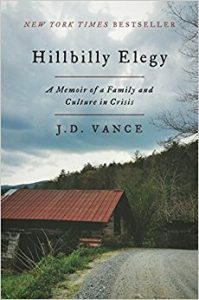 The value of Vance’s book is the window it cracks on the fierce family loyalty and regional pride and sense of justice that belongs to his ‘hillbilly’ culture. That he uses the word ‘elegy’ (a lament for the dead) in the title suggests that the culture he inhabited, and which inhabits him, is in some sense dying or dead. As a memoir, the book is good. Vance’s cast of characters, if truly drawn, are truly fascinating. They can be vicious, and viciously loving. They are complicated, loyal, broken, and real. If only he had been content to write a memoir. But he can’t contain it. It moves from memoir to fairy tale and then to political essay, In so doing Vance prostitutes his story for the sake of a didactic goal. Perhaps it is a good essay, perhaps it is an inspiring fairy tale, but after his grandmother dies, the only characters left on stage are Vance himself and the America about which he wishes to make social commentary. What began as memoir morphs into an essay on the American white middle class, and his stories and characters become merely the platform for his commentary. And that is sad. Stereotyping and ridicule, of the type I too often embraced as a child toward those we derided as ‘hillbillies’, dehumanizes. As memoir Vance honors his characters, his family, and his culture by humanizing them. He then turns the newly humanized into objects, making them merely the representatives of societal trends, illustrations of his own social commentary. That’s it. The real magic is the story. The shame is that Vance and his editors could not let the story be. This was highly recommended by a member of one of my book clubs. I’ve requested it from the library. I’m probably 37th in line! When I do eventually get and read it, I’ll keep in mind your thoughtful comments, so I thank you for reviewing.